As you assemble the over 140 assorted size pieces, you'll be amazed as this insect takes shape right beneath your fingertips! 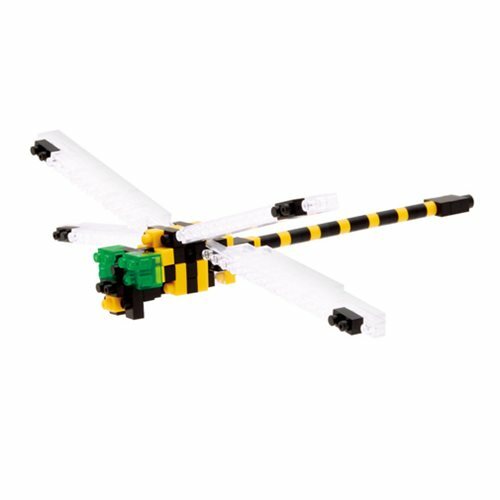 With a finished size of 5 1/2-inches long x 4 1/2-inches wide x 2 1/4-inches tall, the Dragonfly Nanoblock Constructible Figure fits perfectly in the palm of your hand. It comes with detailed color instructions. Ages 8 and up. Level of difficulty: 3 (on a scale of 1 to 5, with 5 being the most difficult). With many different insects in the nanoblock "mini+" collection, you will be inspired to collect, build, and display all your works of art! Other figures sold separately.